PG, Do you think DGAZ is good for a fast trade? Daytraders sell UGAZ, correct? 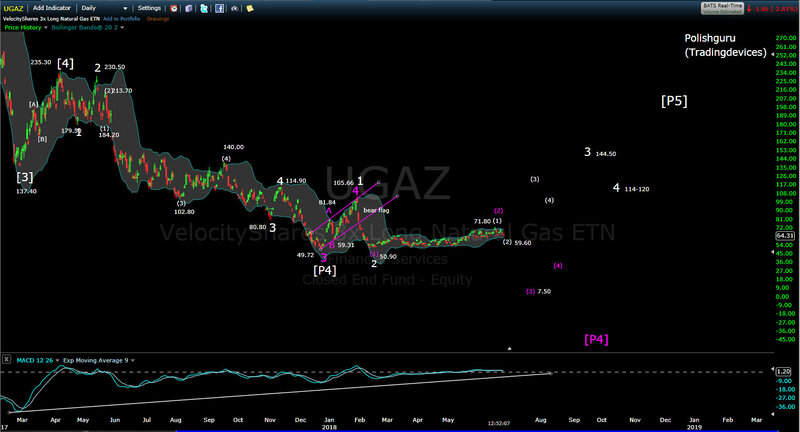 I am in UGAZ for a longer term play at $61 avg. Thanks. we can push to 61.8% retrace at 63.50 before that pull back, thoughts? Pg do you still expect pull back? Any body watching UGAZ – nice move ! Every Thursday at 10.30 there will be a big move. Natural gas report comes out at that time. ugaz just hit sell target, who is holding? 53.70 stop loss must at 53.00…MUST!!!!!!!!!!!!!!!!! Gap down. Good call. Taking profit on dgaz. Pg can you confirm buy on ugaz as gap down is smaller . 5 pt drop from last hi above 60 in A.H. This is where I am always in awe of his calls. How the hell does one know of that retest. Great call PG. Pg is this gonna be deep pull back? do you have target on reentry? do we consider current low as successful retest lows? From the high of 72 the last bounce could have been wave iv……..its going to be a clean 5 waves down…retest of lows very possible ( just like he said)…..we might even lower. Yes……………..from the low of 50 to the bounce of 54 as (a) now (b) and (c) to finish wave 1 up.. Wave 1 up as part of impulse will have 5 waves. abc waves are always corrections and should be either 2nd or 4th waves. PG’s target met. Reversal after 10:30 am? i wonder if this is bounce or we starting wave 3 up. Pg what is chance of retest lows / pull back on ugaz? This could be wave 1 up………………OR simply have not finished wave 5 of 2 white down yet.. and this bounce could have been wave 4 of 5 of 2 white…. (I doubt that). Today’s action was the end of wave 2 white….or end of wave 1 of 5 red………..
53.40 and as low as 51.20. You have to at least respect the fact that it can overshoot and there may be exhaustion gaps. I’m back it at 52.44. USE STOPS ! PG …….one question for you , Base on the internals and indicators , do you favor white or red……..I mean once we hit your lower target , is this just gonna be a bounce and follow the roule # 9 again….Or better say what is the number to eleminate white ..??! !..Thanx……..not forgetting that you also said NATGAS will brake 2 and rich 5.
and….things will come to those who wait. UGAZ back below 1st buy. Is 51.20 in cards? I am a thinker on a technical blog. But if Trump ever gets Europe to buy nag gas from the United States Nat gas will go higher than 5. He is already dropping hints for Germany to stop buying from Russia. Service stocks will explode to build the infrastructure. and CHK … well you know. PG just wondering if 15 and 30 min pos D still in effect or can that expire? I’m looking to buy (not perfect) but is 53 support zone more probable? OR………….is there any pop on pending? Is there a target after this pop ? pop sold, is there re-entry? from high of 72 (almost) this is wave 3 down. If it drops AH sharply , then tomorrow it would be down big….IF not, still might be another good day. something telling me UGAZ about to change direction. Could it be your position size… LOL. Take it easy. GLTA. UGAZ very strong buy here!!!!!!!!!!!!!!!!!! Is the (3) target up in play to over 100? Or are we still in a triangle push to about 70? PG, What is the NG price we should be looking at for 2 white? I sold my DGAZ and bought a half a position in UGAZ for a longer term swing. making money, this bounce has a target? IS UGAZ on it’s way to (1) white. I just assumed it was already in and it was headed south to (2) white ?? (2) white is way below lower bb and would be quite a drop. PG, Yesterday you mentioned UGAZ long. I am assuming its just a bounce before it bottoms below 60 for 2 purple. Can you post your target for this bounce please? He already said long UGAZ………….and gave the target for natural gas too….and with all that positive divergence…….he would have no comments on it……..He said long UGAZ not a bounce. Will see 60 before 72. white 2 is not in yet. At 2 white UGAZ will be a good long. Is FCX ready for a bounce? Looks like you favor the white wave count PG with the + divergence shown on MACD ? Thanks PG for the chart, I’ll put a but at 62 area MA (50). Sorry about the football team.